January 26 is (currently) celebrated as Australia Day. It's also the anniversary of the only military coup in Australia's history, an 1808 event which led to Australia being run like a rebel republic for two years. The coup was led by wealthy local businessman John Macarthur, who would later be declared insane, and the greedy officers of the New South Wales Corps. The victims were Commodore William Bligh and the civil service officers and settlers who remained loyal to him - the same William Bligh whose crew had mutinied on him when he'd commanded the Bounty, and who had been sent by the British Government to stamp out the corruption in the colony of New South Wales. Known as the Great Rebellion well into the 20th Century, it later became known as the Rum Rebellion - a title which implied a jolly romp. But there was nothing jolly about this corrupt, brutal affair, one which legal experts from Dr H.V. Evatt to Geoffrey Robertson have considered totally ilegal, a traversty of justice, and a blot on Australia's history. With anyone who supported by Bligh being deprived of their labour, and, often their liberty, the only way that some settlers found to protest was by giving their newborn sons the first and second names of William Bligh. This tradition has continued in the family of current prime minister of Australia Malcolm Turnbull, whose firstborn son is William Bligh Turnbull. Taken from court transcripts, diaries, letters, and newspaper accounts, this gripping book reads like a novel as it tells the incredible true story of the days when fear and favour ruled in Australia. 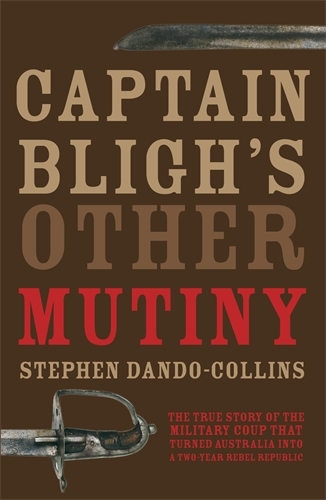 Bligh wasn't perfect, but as this books shows, his opponents were rogues of the worst order.